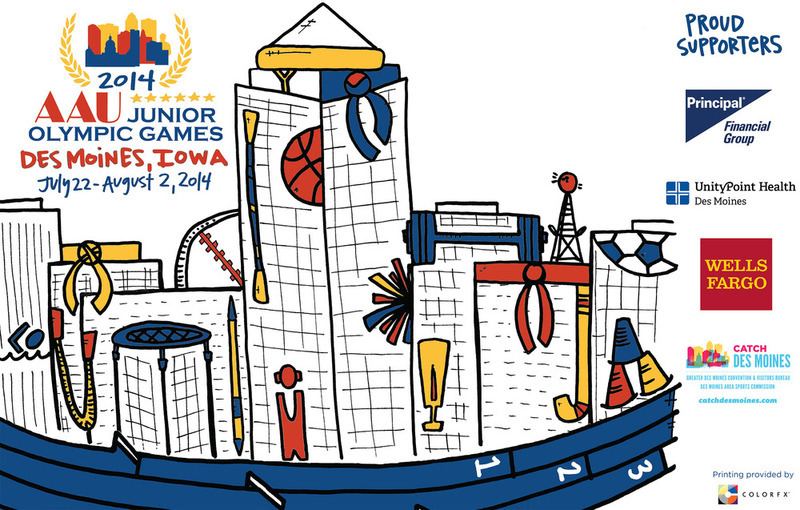 14,000 athletes aged 3 to 22 will take over Des Moines (my city!) from July 22nd to August 2nd. These young people have worked hard to compete in sporting events ranging from Kung Fu to Powerlifting. When the Convention and Visitors Bureau, my favorite folks promoting Des Moines, came to me asking if I'd be willing to work with them to do a poster, I [trampoline] jumped at the chance! So many ways to support these athletes as a spectator or volunteer! You can purchase an event passport to see all the events for $40. Cheer on the Field Hockey teams, support the javelin throwers or keep your World Cup dreams alive with the soccer matches-- all for only $40. Join me and many others by volunteering! Another great event in my favorite city... and a drawing I worked on will be in front of 14,000 people. Big week for me and for Des Moines. What are you waiting for? Catch the Spirit!